Chair of the Ballymena Branch of Parkinson's UK, James McClean, and Ballymena branch member Margaret Parkinson, present a gift to dance instructor, Charmaine McMeekin, who took a series of Movement to Music classes in Ballymena for people affected by Parkinson's. 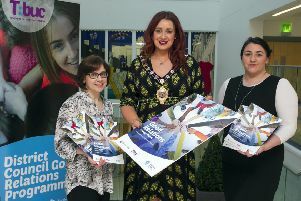 The class was held over six weeks at Ballymena North Business Park and finished in March. People attending the Parkinson's UK Movement to Music class which was tailored for people affected by Parkinson's Disease.The class was held over six weeks at Ballymena North Business Park and finished in March. It was led by dance instructor, Charmaine McMeekin, and attracted a good turnout. It was led by dance instructor, Charmaine McMeekin, and attracted a great turnout. Pictures of the event featured were kindly submitted for publication.